His ‘Keur’ IBOP A dam is a daughter of the full sister of the Holstein top sire ‘Lord’. The bloodlines of his sire and dam guarantee top performance as Emilion himself has already proven. Emilion jumped with U. Kirchhoff at the highest level, taking 1st in the World Cup at Mill Street, 4th in the Grand Prix Valkenswaard, 2nd in the Grand Prix Donaueschingen, 5th in the Grand Prix London and 6th in the World Cup at Arhus. With the German Team, he was 4th in Dublin and Rotterdam and 2nd in Bremen. Offspring of Emilion are successful in several Grand Prix and World Cup classes. Glasgow is for years one of the most winning horses of the USA. He won several classes World Cups and Grand Prix. 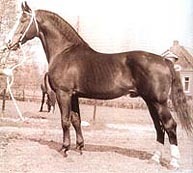 This year he won for the 3rd time in five years the CN Reliability Grand Prix of Canada, before he became ‘USA Horse of the Year’. VDL Emmerton was successful in Sweden and was this year 3rd in the Grand Prix of Zuidlaren and 6th in the Grand Prix of Drammen. VDL Nantes became reserve-Champion of Brazil and is now selected for the World Cup final in Las Vegas. Other offspring that are successful at the highest level are: Enorm - St. Endresen [Nor]; Inspiration - E. Smidts [NL]; Miss Montana - E. Tacken [NL]; Fritsy - R Helsen [Bel]; Jashar - C. Bronfman [USA]; VDL Lotus Exel - H. Dobbs [USA], Jemilion - S. Parot [Chi]; Karina - R. Withaker [GBR]; VDL Edminton - J. Vrieling [NL], winner of the Grand Prix of Leeuwarden. Two of his approved sons VDL Sarantos and VDL Empire break through at international level: Sarantos won several international classes, Empire was Champion of the 7-years old jumpers in Sweden and won a qualification class at the World Championships in Lanaken. 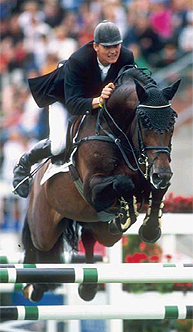 In 2003 VDL Empire was Dutch Champion of the 4-years old jumpers. Also Tomboy with R. Brouwer and El Tombo Z with S. Guerdat are several times placed in the young horse classes. 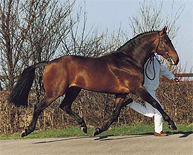 In 2005 Easy in Out was Champion of the 4 year old jumpers in Italy and his son Exalibur became Champion of the 4-years old jumpers In Austria. VDL Sill was 4th at the Dutch Championship for 7-years old jumpers and was also winning one of the qualifications at the World Championships in Lanaken. Emilion has proven to be one of Worlds best jumper producers!